F1, known as Formula One on North American packaging is a formula one racing game developed by Lankhor and Teque London and published by Domark. 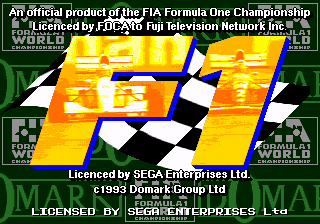 It should not be confused with the later game, F1 World Championship Edition, also published by Domark. F1 was released in 1993 for the Sega Mega Drive, Sega Master System and Sega Game Gear. No versions of this game were released in Japan, while the Game Gear version was exclusive to North America. F1 is a pseudo-sequel to Lanhor's earlier release, Vroom, originally released in 1991 for the Amiga, Atari ST and IBM PC compatibles. On the Amiga, this relationship is even closer, with earlier versions of the game being released as Vroom Multiplay before acquiring an official license from FOCA. Both F1 and Vroom share graphics and sounds, though F1 adds further refinements to the engine and stands as the first time one of Lankhor's racers was released on a home console. F1 attempts to replicate the 1993 Formula One season, providing 12 tracks roughly based on their real-life counterparts and seven constructors; Benetton, Ferrari, Ligier, Lotus, McLaren, Tyrrell and Williams. Producer Jim Tripp is also included as a driver in a special "Domark" team. 1993 champion Ayrton Senna is omitted due to licensing issues (likely thanks to Sega and its 1992 release of Ayrton Senna's Super Monaco GP II). That being said, racers are only differentiated in-game by a change in colour, and the player always races as him/herself under a generic "SEGA" banner. Even on the Mega Drive, F1 is severely limited by the hardware, so while the basic track layouts of the season are in place, the aesthetics very different to the real thing. In real life, the Monaco grand prix for example takes place in a built-up area next to the coast, while in this game there are no bulidings or water, just a road surrounded by grass. The Mega Drive version uses a mixture of 2D sprites and 3D polygons to simulate its game world, however the limitations of the hardware means frame rate is usually sub-30FPS at any point in game. To partially negate this issue, a "Turbo" mode is included, which renders less of the play area and uses smaller sprites, allowing the game to achive greater speeds. For 1993, however, both modes outperform most 3D polygonal-based games seen on consoles at the time (for example, critically acclaimed Super NES shooter StarFox runs below 10FPS despite the addition of a dedicated Super FX chipset for processing polygons).